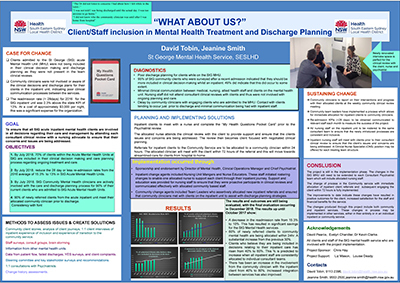 The St George Acute Mental Health Unit (MHU) developed a new model of care that increased the involvement of clients in their clinical care and discharge planning, through improved communication between mental health clients, clinicians and nursing staff. To increase the number of clients who are admitted to the St George Acute MHU and included in their clinical care reviews and discharge planning, to 70 per cent by October 2018. Improves discharge planning, goal setting and outcomes for mental health clients. Enhances communication between mental health clients, clinicians and nurses. Increases referrals and access to community clinicians for MHU clients. Increases involvement of the client in their treatment and discharge planning. Improves client and staff satisfaction with the St George Acute MHU service. Reduces unplanned readmissions to the MHU within 28 days of discharge. Delivers care in line with the SESLHD Mental Health Clinical Services Plan. Prior to the project, the St George Acute MHU experienced poor clinical communication between medical staff, clinical staff and clients. There was limited evidence of clients being included in their treatment and discharge planning, with clients providing feedback such as: ‘I was not informed about the medication I was made to take’ (YES Survey, December 2016) and ‘Sometimes when I summoned the courage to ask questions about my care, they were minimised or ignored’ (Compliments and Concerns Group, February 2017). There was also a lack of structure for communication between Community Mental Health Service staff and St George Acute MHU staff. Clinicians at St George Acute MHU were sometimes unaware that important treatment or discharge planning meetings were taking place and as such were not part of the clinical decision-making process. There is a relationship between the level of client involvement in their treatment planning and their ability to follow the instructions in their discharge plan. Not understanding or following a discharge plan can lead to clients being readmitted to hospital shortly after discharge. In 2016, the readmission rate within 28 days of discharge at St George Acute MHU was 15.3 per cent, higher than the statewide target of 13 per cent. In addition to the negative impact on healthcare outcomes of clients, unnecessary readmissions are a significant cost to the organisation, at approximately $3000 per night for an acute MHU bed. Reducing readmissions down to 12 per cent by July 2018 is expected to result in an average saving of $34,000 per month. By improving clinical communication and engaging clients in their treatment and discharge planning, it was anticipated that St George Acute MHU would be able to reduce readmission rates and improve the healthcare journey of its clients. the structure of the nurse roster and delays in allocating a community clinician for referred clients prevented staff from consistently engaging with clients while in the MHU. Surveys, consultation forums, one-on-one interviews and detailed client journeys were completed with a diverse range of staff and clients. These included inpatient clients, discharged clients, clinicians, nurses, medical staff, peer support workers and other key stakeholders. community teams allocated new clients within 24 hours of referral, providing an in-reach service within 72 hours of admission. Education was provided to nursing staff on increasing engagement with clients and how to advocate on their behalf in clinical reviews. The initial pilot using one consultant psychiatrist, two nursing staff and seven clients will be expanded to all consultant psychiatrists, nurses and clients in March 2018, if successful. The process of nursing staff meeting with clients and attending the clinical review did not occur as planned, due to an outbreak of norovirus followed by influenza that closed the ward. This made it difficult to have the same two nurses provide care for the consultant psychiatrist’s clients. Despite this setback, nurses attended 50 per cent of clinical reviews as of November 2017, which is an improvement on the pre-implementation rate of zero per cent. percentage of newly-referred community clients in the MHU who were seen by their community clinician within 72 hours of referral. Ongoing communication and feedback with all stakeholders is critical to the success of the project. Projects often take more time than anticipated. If completed within work hours, two full days per week is required up until the implementation phase. It is important to find a project sponsor who is approachable and available during the course of the project. To increase the chances of success, make adjustments to ensure the project meets the frame of reference. Be clear about what is being changes and why, as well as the desired outcomes and benefits. Remember that the project can only succeed with the cooperation and support of people who have the ability to create long-term change (change agents).